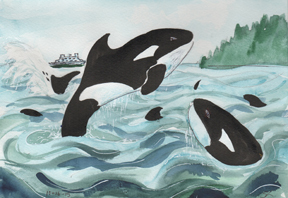 small (6" x 9") watercolor of Orcas we saw--sold! I plan to resume my series on watercolor techniques on Monday or Tuesday. Coming up is the second (and last) weekend of the Vashon Island Winter Art Studio Tour. I sold some paintings last weekend! Also sold some of my Peacock Princess story coloring books and my calendars with my photos of Vashon Island. Not a way to pay the bills, but I think I've made expenses so far, and a little profit to give to the International Rescue Committee. I feel so blessed to be living a wonderful life! I have time and inspiration to pursue my art, money for materials, a sweet loving man for a partner, healthy compassionate children and grandchildren. I wish this happiness for you as well! Its a Wrap: Vashon Island Studio Tour--Profit?